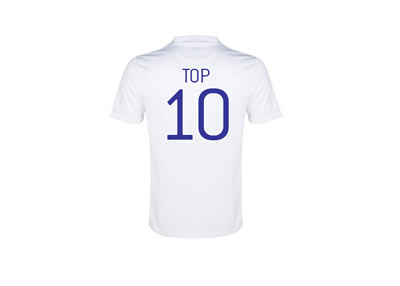 Here we take a look at the top ten best selling football shirts in 2015 according to the online megastore Kitbag. Headquartered in Manchester, England, Kitbag is the biggest reseller of licensed football shirts in the world. They have exclusive rights to operate official online stores of clubs such as Manchester United, Real Madrid, Barcelona, Chelsea, Manchester City and Borussia Dortmund. Is it a surprise at all that the Argentina national team and Barcelona FC shirts with the name of Lionel Messi on the back are the biggest sellers again this year? Most players above are from the big four English Premier League teams and the two Spanish giants, Real and Barcelona. Whose shirt are you eyeing this year?